Automotive thermal system is concern with the management of liquid, temperature and air. It increases the comfort of the passengers by taking care of the temperature inside the vehicle. The main components of automotive thermal system are powertrain cooling, ventilation & AC, battery thermal management, power device cooling and waste heat recovery. Implementation of new technologies such as HVAC systems for thermal heating is driving the market globally. The primary advantage of this advanced system is that it reduces the harmful gases emitted by the cooling system compressors without compromising on the cooling capacity. The manufacturers of HVAC systems have replaced the existing HFO-1234yf cooling technology used in automotive HVAC systems with the R-134a technology due to the harmful effects of some refrigerants. Implementation of new technologies and upgrade of existing ones is among the key drivers for the growth of this market globally. The rise in cost of the automotive thermal system is a major challenge restraining the growth of the market. Advanced and improved technology comes at a higher cost. Huge investment is required for research and development which in turn increases the cost of thermal systems, hence leading to increase in the price of automobiles. Increasing demand for thermal systems that run on alternative fuels such as bio-alcohols, liquid hydrogen, propane, P-Series fuels, and ethanol is a key opportunity for the growth of the market in the near future. Manufacturers of automotive transmission systems are investing significantly in research and development for innovation of latest technology in automotive transmission. ZF Technologies introduced the world’s first nine-speed automatic transmission system. This is likely to enhance fuel efficiency of vehicles considerably. There is a growing demand for vehicles with continuous variable transmission system. Driving a continuously variable transmission system is the same as driving a vehicle with automatic transmission, just that the engine revs up and down automatically. There is a growing demand for vehicles with continuously variable transmission due to its simplicity and enhanced performance. Therefore, this technology is likely to dominate the market in the coming years. HVAC dominated the automotive thermal system market segmented by component. The HVAC system provides heat, ventilation and air conditioning in a vehicle. The HVAC market can be segmented into two types, automotive HVAC system and manual HVAC system. The rise in demand for HVAC is one of the key factors behind the growth of the automotive thermal system market as a whole. 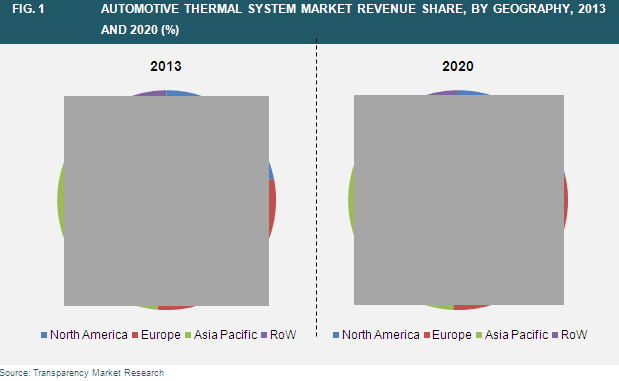 Geographically, the global automotive thermal system market has been segmented into four major regions: North America, Europe, Asia-Pacific and Rest of the World (RoW). Asia Pacific dominated the automotive thermal system market in 2013 followed by Europe. Developments in the infrastructure sector led to the rise in demand for construction vehicles. In addition, the rise in disposable income fuelled the demand for automobiles in Asia-Pacific and this is expected to drive the demand for thermal system. Asia-Pacific has been the largest contributor to the growth of the automotive thermal system market. The luxury car segment is dominated by Japan in this region. In addition, the emerging business class in India and China along with the green revolution in the automotive industry is also driving the automotive thermal system market in Asia-Pacific. Increase in GDP levels, government norms and regulations, change in attitude of society towards the environment, and technological advancement are the key factors driving the automotive thermal system market. The growing business class in China and India, coupled with the green revolution in the automobile sector is further driving the global automotive thermal system market. The degree of competition in the automotive thermal system industry is high. This is a consolidated market and thus there is very little price-based competition. Established players invest a huge sum of money in research and development activities in order to innovative new technologies which would help them increase their competitiveness in the market. Some of the major players in the automotive thermal system market are General Motors Company (GM) (U.S.), Denso Corporation (Japan), Magma International Inc. (Canada), Valeo (France), Ford Motor Company (U.S.), Delphi Automotive PLC (U.S.), BorgWarener Automotive Powertrain Systems Corp (U.S.), ZF Friedrichshafen AG (Germany), Hyundai Motor Company (South Korea), Continental AG (Germany). This market research study analyzes the automotive thermal system market on a global level and provides estimates in terms of revenue (USD billion) from 2014 to 2020. It gives a comprehensive overview of the automotive thermal system industry from all the important aspects of the market. It recognizes the drivers and restraints affecting the industry and analyzes their impact over the forecast period. Moreover, it identifies the significant opportunities for market growth in the coming years. Automotive thermal systems can be segmented by components into compressor, HVACs, powertrain cooling and fluid transport. The automotive thermal system enhances the comfort of travelling in the vehicle and manages the temperature of the key components in the vehicle. For example the powertrain cooling system takes care of powertrain and prevents it from overheating or freezing. By geography, the market has been segmented into North America, Europe, Asia Pacific, and Rest of the World (RoW). The current market size and forecast until 2020 have been provided in the report. Increase in demand for automotive heating systems is among the major drivers of the automotive thermal system market. Automotive heating and cooling systems require sensors that can detect the engine and cabin temperatures.. Moreover, increase in demand for luxury cars in the Asia Pacific and Europe regions is also driving the thermal system market. The growth in demand for new advanced HVACs which are much lighter in weight and environment friendly is driving the automotive thermal system market particularly in North America. Asia Pacific is one of the most attractive regions in automotive thermal system market. The Asia-Pacific is experiencing a steep growth in the automotive thermal system market. Implementation of new technologies such as HVAC systems for thermal heating is driving the market in this region. Moreover, huge Infrastructure development is driving the heavy vehicle market and construction equipment vehicle market, as there is a heavy dependence on these types of vehicles for the purpose of construction activities. Rise in demand for air conditioning in commercial vehicle in Asia-Pacific is also driving the vehicle market. In addition, the developing countries such as India, Japan and China are further boosting the market with the production of huge number of vehicles in the Asia Pacific. Europe followed Asia Pacific in terms of market attractiveness. Presence of countries like UK, France, Italy and Germany has lead to considerable growth in the automotive thermal system market due to increased demand of automobiles and change in preference of consumers to smaller, compact and advance HVACs and climate control systems. Moreover the government norms on emission form vehicles are particularly strict in the European countries and thus it requires constant up gradation of components used in the automotive thermal system to keep up with the emission standards. This is further boosting the automotive thermal system market in Europe. This report provides tactical analysis of the automotive thermal system market and the growth forecast for the period 2014 to 2020. The span of the report includes competitive analysis of various market segments based on the types, module and in detail cross sectional analysis of the automotive thermal system market across diverse geographic segments. To maintain the strategic decision making, the report also includes profiling of leading players in the industry, their market share and various strategy adopted by them. The Porter’s Five Forces analysis and market attractiveness analysis is also included in the report provide imminent market dynamics and market competition. The report also provides company market share analysis of the various industry participants along with company overview, financial overview, business strategies and recent developments in the field of automotive thermal system market. Major market participants profiled in this report include Behr GmbH & Co. KG, Denso Corporation, Gentherm, Valeo, Delphi Automotive Plc and Vsteon Corp.